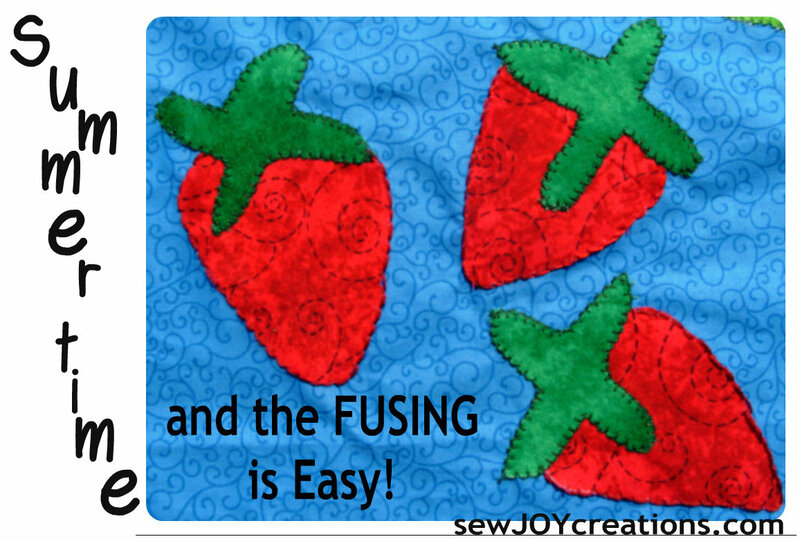 Are you ready for some fusing fun? 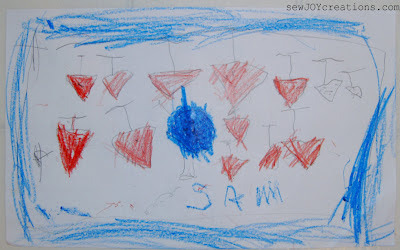 During the last month of school my son kept coming home with gardens he had drawn. This one is full of strawberries with a big blueberry in the middle! Does it look like a quilt to you?!?! Plus I liked how the strawberries just looked like triangles. Simple lines to create a sweet treat. It got me thinking that fusing strips of fabric then just making diagonal cut lines could create a whole row of strawberries. Really quick and easy! 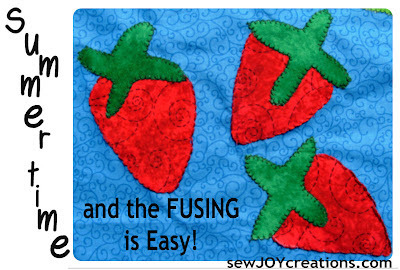 My favourite fusible for this technique would be Mistyfuse because there is no paper backing to worry about coming off before I'm ready to use the fabric. Plus, with making triangle shaped fruit, I don't really need templates! 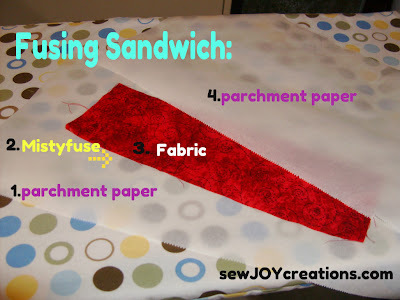 You can use whatever fusible you have on hand. Whatever fabrics you have on hand! I ended up creating a few different fruits and a carrot. Simple shapes to cut freehand. 1.Drew my idea on a piece of 8.5 x 11 inch paper. 3.Cut out my shapes from fused fabrics. 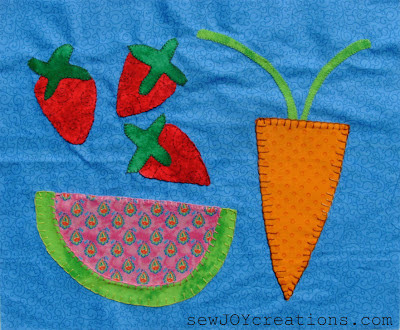 One cutting tip - I made the strawberry 'tops' by cutting freehand 'x's out of the fabric. 5.Stitched around raw edges with different colour thread. 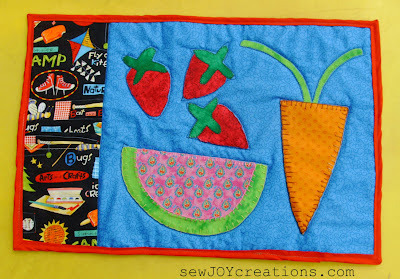 Most I did blanket stitch by hand, but the carrot top I used my machine. I did stem stitch around the strawberries. Then I made a placemat! My son saw me making the fruit and immediately thought they were for him! With his birthday coming next week, I put on my birthday gift thinking cap and made my appliqued piece into a placemat. 2.On the top edge of pocket you will want a finished edge: simply fold under 1/4 inch seam, then fold under another 1/4 inch seam. Sew to create a hem. 3.Line up pocket with RIGHT SIDE UP on bottom half of pocket panel. 4.Put appliqued piece RIGHT SIDE DOWN on pocket panel, lining up the edges you are going to sew down. You *could* put your pocket on the other side of the appliqued piece. 5.Sew to join edge. Press seam open. batting, then appliqued panel RIGHT SIDE UP. 7.Pin baste and quilt placemat remembering NOT to sew the pocket closed! I simply stitched in the ditch where the pocket panel and appliqued piece joined. Then around each of the fruits and veggies with blue thread to match the background. 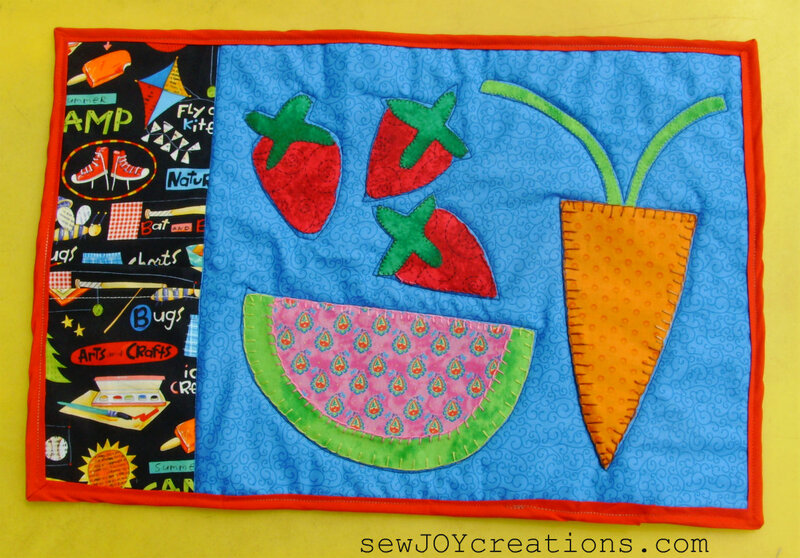 8.Trim placemat to 12 x 18 inches. Make one Just Like Mine! Of course, I went one step further and made templates for you. Just in case you wanted your fruit to look like mine! You can use any fusible product to copy the templates. If you are using Mistyfuse, copy the templates onto one of your pieces of parchment paper. When you fuse, make sure the pencil side is touching the Mistyfuse. You can leave the parchment paper on and cut out your shapes - or remove the paper from lighter fabrics and cut on the transferred pencil lines. Long post! Hope you enjoy it! Oh my gosh. Super super cute. I love how you did this.